Since the early 1970s, Marcia Hafif has deconstructed and systematically examined the fundamentals of painting. Her long-term project—programmatically titled Inventory—investigates the chemistry, application, installation, format, and art historical precedents of the medium itself. Hafif has developed a rigorous body of work with a resolute concentration on the issue of color. She uses oil paint—based on a range of pure pigments, glazing techniques, complementary combinations, and specific colors from earlier eras—to create subtle and complex monochrome paintings. 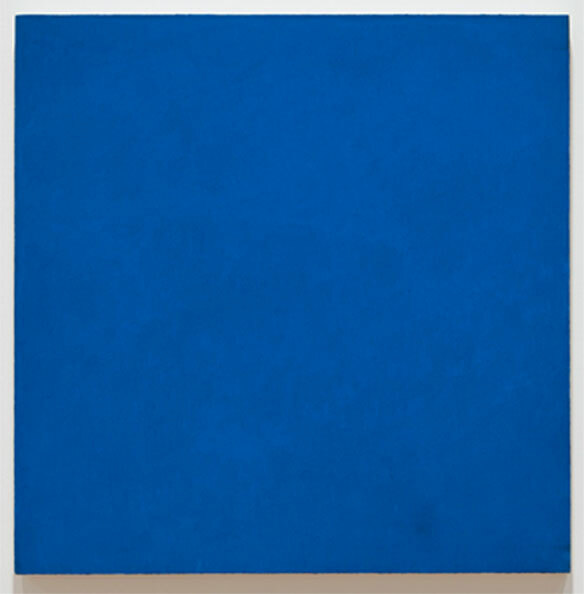 Mass Tone: Manganese Blue is from a series of ruminations in which each work was titled after the specific pigment that Hafif ground by hand with a muller and combined with linseed oil. Unlike commercial paint from the tube, which contains various additives and binders, her handmade pigments can behave in unpredictable ways. The results are deeply varied and complex surfaces. As Hafif has stated, the patient technique was used “to let a color like Prussian Blue express itself, reveal its multiple nuances.” Her process invites each particular paint mixture to be investigated and perceived as matter rather than simply as color.